Probably the world's most famous chilli. 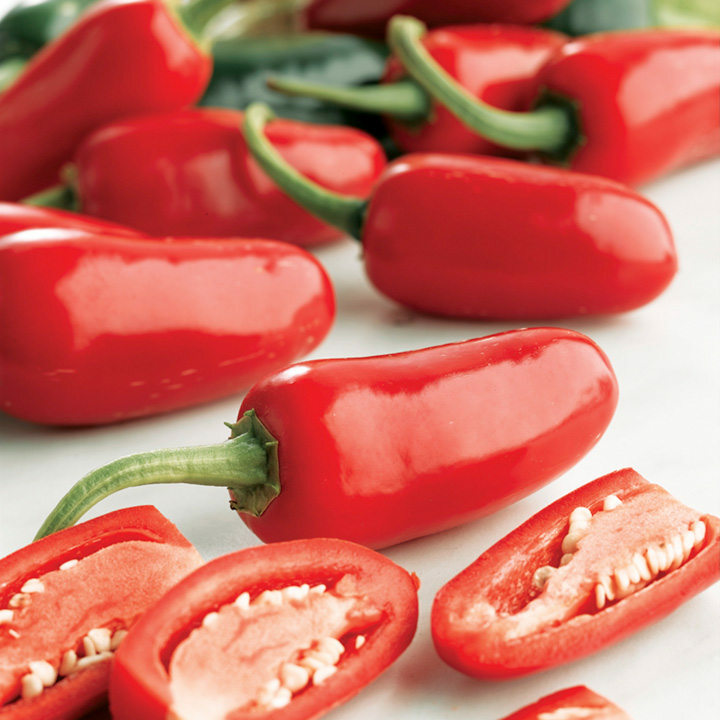 The unique flavour works perfectly when sliced onto a pizza or to spice up a simple sandwich. When in a green state the Jalapeno is great to eat but becomes a little sweeter when they turn red. Suitable for glasshouse or outdoor production. Height 120-130cm (48-52") in a 7-10 litre pot. (Mexico) - 2,500-5,000 SHU. Probably the world's most famous chilli! On Receipt - Check the plants are moist and grow on in 10cm pots using a good quality potting compost. When planting, ensure that the graft is well above soil level to prevent the scion rooting into the soil which would reduce resistance to soil borne diseases. Maintaining a temperature of 16-18ºC (60-65ºF) and provide a cane support. Growing On - Once the roots fill the pots, transfer into 30cm (12″) pots or plant in the greenhouse border 60cm (2') apart. The plants are not suitable for growing in grow bags due to the strong root system. They are vigorous plants and as the fruit start to set start feeding twice a week using a liquid tomato fertiliser. On hot sunny days damp down the pathways to increase the humidity and misting the plants with water will aid fruit setting. The plants can be grown on a sunny patio once the danger of frost has passed in early June but the best results will be obtained when grown in the greenhouse.